Complete renovation projects or new installations often benefit from having a landscape design which consists of either a scaled drawing or sometimes just a sketch showing the house, patios, driveways, trees etc. 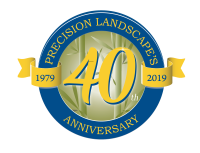 Precision Landscape works with an independent landscape designer when a comprehensive plan for your landscape is needed. However, many of our clients already have an outline of a design in mind. They already know where their lawns and beds will go and just need help in plant selection, configuration of patios or paths, or utilizing our various areas of expertise in both design and construction. With these clients we develop a plan and a design without the expense of an actual scale drawing. We have found over the years that even just using ground paint on the yard will help illustrate our ideas so the client can clearly see what is envisioned. When the proposed design is visually laid out right there on the ground, where it will actually be installed, agreement and understanding are achieved much more easily. 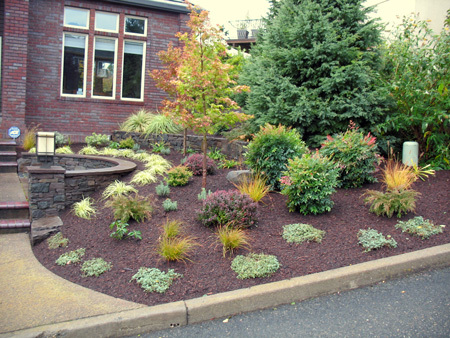 The landscape you choose to install now will be with you for many years to come. We want for you to be satisfied with the end result of our efforts and will work to accomplish this end. We will work closely with you, learning your wants and needs. Then we will design to satisfy those needs and desires. As much as possible we take a naturalistic approach to landscaping. We try to make the landscape blend into the surrounding environment. We use quality materials, whether plants or general construction materials. Are you thinking about extending your indoor living space into the out of doors. If not, you might consider it. Many Portlanders are doing exactly that. If you like to spend time in the out of doors, you may discover your new outdoor living space to be one of the most enjoyable parts of your home.